And this time the bartenders are calling the shots. Our first Fall Cocktail Challenge event, coming next Friday, will bring together 20 of Chicago's finest barkeeps for what is essentially a huge round of dealer's choice, with each participant using an assigned spirit to craft a drink with an autumnal theme. 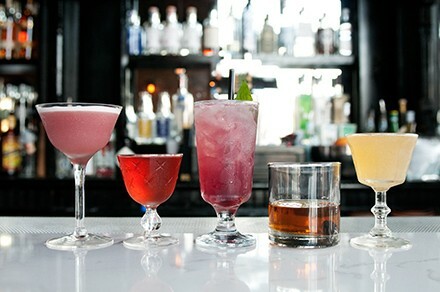 As readers know, this differs from the regular format of our Cocktail Challenge, where the bartenders themselves choose the ingredients, which have ranged from the innocuous (dragon fruit, falernum) to the satanic (Kraft cheese powder, cod milt). But this means that Mike Ryan of Sable, who kicked off the feature back in 2011, won't have to tangle with the invasive weed garlic mustard. Vegan Paul McGee of Three Dots and a Dash won't have to go near beef stock or marrow bones, but instead has the alcoholic equivalent of a hanging slider to Miguel Cabrera: rum. Brazilian rum should likewise be in the wheelhouse of past challengee Justin Anderson, drinks master at La Sirena Clandestina. Nahm Kim of Sunda has whiskey, while Danielle Lewis of GT Fish & Oyster will crack open the tequila and Dave Michalowski of Fischman Liquors & Tavern will tackle white wine. Others participating include Karl Fernandez of Old Town Pour House, Brandon Phillips of the Drawing Room, Vlad Masillion of RM Champagne Salon, Jessica Tessendorf of Barrelhouse Flat, and Joel Gardner of Lula Cafe. So what's the challenge? you ask. For one thing, pleasing the judges: Reader food writer Mike Sula, new Check, Please! host Catherine De Orio, and cocktail blogger and consultant Todd Appel of Splash Mix Cocktails, who'll award titles for both the most creative and the most delicious cocktails of the evening. The crowd will have a say as well, with the option of voting via Instagram. The shindig's Friday, October 4, from 6 to 8:30 PM at State & Lake, 201 N. State (conveniently located across from the Lake Street el stop). Tickets, which are $40, cover samples of all 20 cocktails, food, still more drinks, and a DJ.